The battery container and cover are available both in V0 class flame retardant ABS or HBO ABS plastics. With more than 15 years of production experience, VISION FM series of VRLA batteries are recognized as the most reliable and high quality battery system in the industry. •Raw materials are sent to lab for analysis and strict inspection. • In Process 100% Quality control , sampling survey and random checking for the product performance. •The products are 100% tested & inspected before packing. •For the product returns, analyze the causes and recommend corrective measures to improve it. The Quality Department consists of more than 130 well-trained and experienced staff. Vision implements the ISO9001 quality system throughout all manufacturing processes and strictly controls product defect ratios per PPM standard. What's more, pride is taken in adopting new and advanced equipment into the production lines to continuously improve product consistency. In-house QC staff are responsible for QC. Among the 139 QC staff members, there are 30 engineers and 40 technicians. The QC staff is proficient, vigorous and conscientious. QC procedures are strict, meticulous and conform to related international standards. Raw materials are sent to testing rooms and labs for analysis and strict inspection. 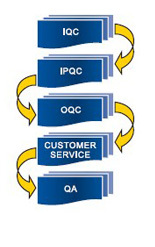 IPQC and LQC (Line QC) are implemented in production. Checks are performed at multiple steps throughout the production process with 100% of the finished product being systematically performance tested prior to packaging and shipment.